Breast tomosynthesis is a new method for breast cancer screening and diagnosis. 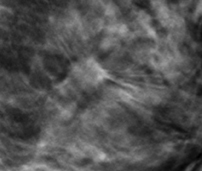 Unlike prior-generation mammography systems, which generate 2-dimensional images, breast tomosynthesis produces 3-dimensional images, which are intended to reveal the inner architecture of the breast free from the superimposition of overlying structures. While tomosynthesis can be acquired independently, a screening examination, as required by the U.S. Food and Drug Administration (FDA), includes a tomosynthesis data set in combination with a 2-dimensional image. The perfectly registered images take only seconds longer to acquire than a conventional 2-dimensional digital mammogram at a total exam dose within current FDA guidelines for screening mammography. A tomosynthesis scan virtually eliminates detection challenges associated with overlapping structures in the breast, which is the primary drawback of conventional 2-dimensional analog and digital mammography. In addition, breast tomosynthesis offers other potential benefits, including increased lesion and margin visibility, help in localizing structures in the breast, a reduction in recall rates, and increased cancer detection. A 42-year-old female presents for a routine screening mammogram. 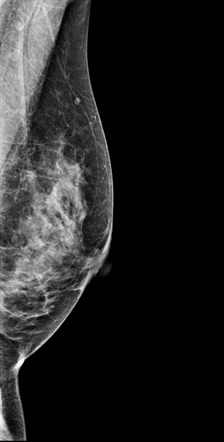 A 2-dimensional mammogram shows no suspicious findings. Upon review of the tomosynthesis dataset, a 7-mm spiculated mass was detected in the upper outer quadrant of the left breast at 2 o’clock. Ultrasound confirmed the presence of a suspicious mass at 2 o’clock measuring 7 mm. Click here to view a video of Dr. Rose discussing this case. Lumpectomy with radiation. No chemotherapy. The use of tomosynthesis in the screening setting was essential for the early diagnosis in this patient. The tumor is imperceptible on standard 2-dimensional imaging, however, the tomosynthesis slices demonstrate a spiculated mass because of the ability to peel away the superimposing tissue that obscures the distortion on the 2-dimensional images. This can be seen clearly on both MLO and CC projections. We have seen a reduction in call back rates for additional testing by approximately 50%, while increasing our detection of very early cancers. 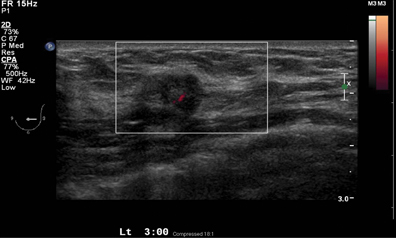 The ultrasound exam confirms the presence of a small lesion at 2 o’clock in the left breast. 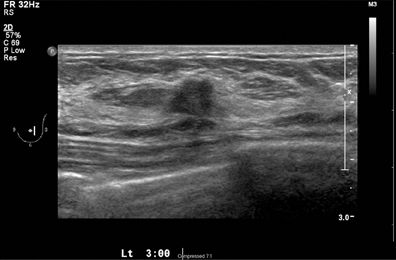 An ultrasound-guided biopsy was performed documenting a 7-mm infiltrating ductal carcinoma. Early detection of breast cancer is associated with decreased mortality and reduced morbidity.1 It is unclear when or if this cancer would be revealed on future 2-dimensional mammography in this heterogeneously dense breast or if it would have only been discovered as a palpable finding at a much later stage in the disease process. In addition to the drawbacks of 2-dimensional imaging, many women, especially in their 40’s, do not get yearly mammograms, therefore, we would miss any opportunity to detect this cancer before it. Gullien R, Eben E, Ekseth U, et al. Reading time of FFDM and tomosynthesis in a population-based screening program. RSNA 2011. Breast series: Emerging technologies in breast imaging. MSVB31-07. http://rsna2011.rsna.org/search/event_display.cfm?printmode=n&em_id=11011027. Updated November 29, 2011. Accessed March 13, 2012. Tabár L, Vitak B, Chen TH, et al. Swedish two-county trial: Impact of mammographic screening on breast cancer mortality during 3 decades. Radiology. 2011;260:658-663. Epub 2011 Jun 28. Tomosynthesis is revolutionizing the way we screen for breast cancer. Appl Radiol.